Provide comfort for the family of Helen Rea with a meaningful gesture of sympathy. 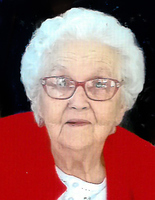 A graveside service in memory of Helen's life will be held on Saturday, June 8, 2019 at 11 am at St. Peter's Anglican Cemetery, Newboyne. Arrangements have been entrusted to the Irvine Funeral Home, 4 James St., E., Brockville. As expressions of sympathy, donations to the Canadian Cancer Society will be gratefully acknowledged. Send condolences or make a donation online at www.irvinememorial.com. A graveside service in memory of Helen's life will be held on Saturday, June 8, 2019 at 11 am at St. Peter's Anglican Cemetery, Newboyne (across the road from St. Peter's Anglican Church, 3600 Newboyne Road, Newboyne ON). Provide comfort for the family of Helen May Rea (Talbot) by sending flowers. Dear Jean, Paul and Family So very sorry to hear of Helen's passing.Helen was a lovely lady glad I had some time with her at BGH GSS. Will be thinking of you in the days to come.